This award spotlights the crucial role women play in Victoria’s rural and regional industries – including our $13.1 billion agriculture sector. The Victorian winner, to be announced on 20 March, will receive $10,000 to implement their project vision. Each state and territory winner will have the opportunity to attend the Australian Institute of Company Directors course before September’s national award ceremony in Canberra. 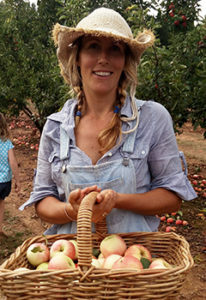 Jade Miles is an orchardist based in Stanley on the outskirts of Beechworth in north-east Victoria. She grew up on a small farm in West Gippsland, with parents who grew virtually all their own food and applied permaculture principles. It was that upbringing that instilled a strong desire in Miles to get ‘back to nature’ in the food realm. Which is where her idea for a community-based food co-operative comes in. Here’s her story. In 2015, you opened the community-owned Beechworth Food Co-op in north-east Victoria. What was the trigger? Our farming communities are decaying, threatening our nation’s food security. We have lower seed and soil biodiversity, higher suicide rates among farmers, longer paths to market, lower profits to growers, obesity/health issues, higher levels of food waste yet higher levels of food scarcity, and more disconnection from our food and to our rural communities than ever before. Yet we ALL eat and have the ability to consider food choices and how they impact our health, farmers and rural communities. How successful has the co-op been since the launch? We opened our doors in January 2015 with 60 products, 80 members and operated for just four hours per week. Now, we stock about 500 products, have 800 members and are open for 16 hours each week. We’ve had an incredible number of volunteers support the initiative (11,000 volunteer hours have been committed to our shop, product research, event delivery and governance), and we’re now working with 35 local growers. Rewind a bit. How did the co-op idea get off the ground? With my husband and three kids, I spent four months in Vermont in the US, researching first-hand what a successful local food system looks like. We visited bulk buying groups, food co-ops, farmers’ markets, farm gate sales, pick-your-own farms and community supported agriculture (CSA) farms to glean insights into the models available and the impacts to the local communities. Then we came back to Beechworth and, with a group of like-minded people, defined strategic goals and a model that would be the most appropriate ‘place-based’ solution for us. So, what does a ‘place-based solution’ look like in Beechworth? It’s a town of just 2700 with many small-scale non-commodity vegetable, nut and berry growers and a rapidly declining commercial apple, pear and cherry industry. These producers were our priority. However, we realised that we needed to create a market before we could ask them to consider us as a viable option for their path to market. So rather than offering fresh food first up, we began with bulk wholefoods that were provenance-identified and sourced as locally as possible. Those who had ethical/regenerative growing practices were given priority. You’ve also launched ‘co-op living’ – 12 events annually, teaching people to reconnect to their food and to each other. Give us an idea of the types of events. We have movie screenings, community pot luck dinners, morning tea gatherings and workshops in things such as fermentation, grafting, compost creation, sourdough making and seed saving. How do you stay in touch with other farming communities dotted across the country? We share our insights, challenges and systems via a platform called Open Food Network which delivers regular “Shared Learning Days” and creates case studies, available on the Australian Fair Food Forum. I speak about our journey regularly at conferences, workshops and education programs all over the country. And how is the co-op inspiring others around Australia? While every local food model needs to be place-based (every town has such particular needs), we ensure everything we create is available to be shared with any other Community Food Enterprise (CFE) and I’m working with CFEs all over the country which are developing a model that will work for their town. Sometimes people want to know how to create a strategic plan, other times they just want to know what online sales system we use. I can relate to the uphill battle of making it all happen from scratch. Also, like them, I’m doing this as a volunteer so I realise how difficult it can be to ensure the idea gains traction. How did your childhood influence your current work? My parents strived for intentional simplicity and it sowed deep seeds. I yearned to have my hands in the dirt and moved to Beechworth when I was 21, planting my first real vegie garden and sinking my teeth into my community. We watched as the small-scale apple and pear growers bulldozed their three/four/five-generation-long apple farming heritage into the ground with the regular simple statement that they didn’t have succession plans for their farms. It was confronting but again, was pivotal in planting the idea for our long-term dream. How long were you planning that long-term dream to own a farm? We spent 10 years researching small-scale farm models, which allowed us to search for the right property and save enough money to buy it. We’ve been on our 20-acre property in Stanley, Black Barn Farm, for two years and in that time, we’ve begun our educational workshop program with open days, grafting days, community lunches and educational lectures with schools and universities. We’ve also undertaken our irrigation infrastructure and soil regeneration program, both of which are key to allowing us to plant 1500 mixed variety orchard trees – grafted on site over the past two Septembers – as well as two kilometres worth of cane berries, which are all lined up for planting in June. Any other food plans on the horizon? I’m eager to develop a podcast series this year, and we’ll continue to deliver our annual events calendar. Towards the end of the year, we plan to launch our weekly ‘eater/grower meet’, for locals to buy their weeks’ worth of food from local growers. What about your long-term vision? Our plan is to open the orchard in January 2020 as a pick-your-own orchard, which offers six months of harvest and workshops/events to really engage people with the delight of growing their own food. Tips for other women thinking of applying for the Rural Women’s Award? I wasn’t going to apply as I felt I was better just getting the ‘grunt work’ done. But after multiple prods from others (all women) I’m delighted to be in this position to shine a light on the potential for others to explore the creation of a local food system in their own backyard. What’s your final piece of advice for women keen on launching a farm community project? Speak from the heart and know that it has value. Know that your contribution to making your community a wonderful, vibrant place to raise your family and call home has more value than the naysayers can see. If we all continue to commit to our communities and work together (which women do so very beautifully), we’ll see significant change in regional Australia.